April 10, 2013 / P.J. I said it last year and I’ll say it again this year — I need to write my yearly review during the winter months before going too far along into the disc golf season. My recent month-long trip to Asia, which included stops in Japan, Taiwan, Thailand and South Korea, put me behind on a few projects, including disc golf articles. I have a lot to write about but very little time to do it. I need to stay on to of my blogs before I fall too far behind. There’s always so much to write about in regard to disc golf as it’s my life and there are always exciting adventures. So, let’s look back at another great year as I take you on a quick journey of some highlights from my 2012 season. The life of a touring professional can be strenuous at times, but I realize I really love to travel as much as I do and I always look forward to the next event. I played very few tournaments this year because of conflicting schedules of other things going on. I haven’t played this few events since 2004, when I stared back at the University of Oregon. Over the years, I have realized it’s about the quality and not the quantity of events I attend throughout the season. I pick and choose the tournaments I really want to play. I used to play 30-plus events per year, but it was always such a grind and I didn’t always get the most out of the hectic travel schedule. I have an amazing passion for gaining more exposure for disc golf. I realize teaching the sport and installing more premier courses is the way we are going to grow the sport. 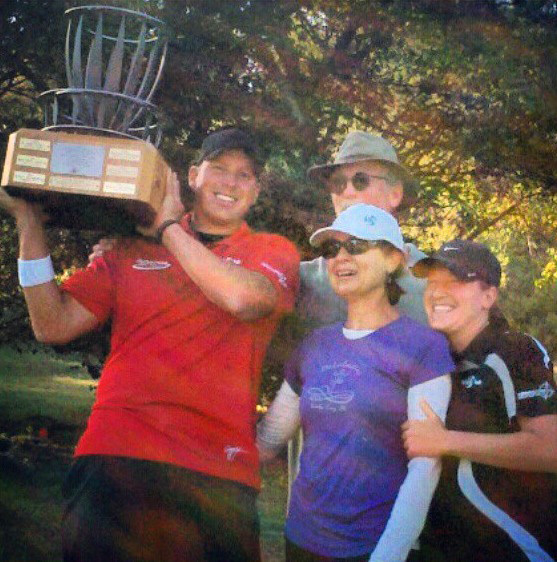 In 2012, I played in 19 PDGA-sanctioned events and had seven top-5 finishes and two victories. Those came at the Lewiston (New York) Luau and the Sula Open in Sula, Norway. I also had several strong finishes at the Memorial Championship, The “Steady” Ed Memorial Masters Cup, the Toronto Island Maple Leaf and the Rochester Flying Disc Open. I traveled to Taiwan, Norway, Germany, Sweden and all over the United States. I would love to calculate those travel miles, but I’m sure it doesn’t come close to the 80,000-plus miles I had in 2008. You can see my full 2012 tour stats here. Also, I was part of the group accepting one of the most prestigious awards in the sport — the 2012 “Steady” Ed Headrick Memorial Trophy. It was presented to Team Jenkins — my parents Leroy and Sharon, my sister Valarie and me, as annual goodwill ambassadors of the sport. This award came as a surprise as none of us were expecting it. The trophy is given out annually at the Master’s Cup in Santa Cruz, usually to an individual who displays the characteristics of giving back to the sport and continuing the legacy of the founding Father of Frisbee and the sport of disc golf. The 2012 season was more than just tournaments for me. It was about increasing exposure for the sport, building awareness, creating a brand, expanding the network, providing quality information and leaving a lasting impression on the community. It’s about taking disc golf to the next level. My season started on a high note in mid-January. I was invited by my good friend, Kuan Chen, to Taiwan for the Taiwan National Championships in Fulong. This was my second trip to Taiwan and definitely a place I love to visit when possible. This event was a very social, non-sanctioned event and was located along the Pacific Coast in northern Taiwan. Players would hang out for all of our rounds. We really got to know each other well. After that event, I spent a week traveling southern Taiwan to Koahsiung and Chiyi, checking out some future tournament venues and meeting some local players. I also had the chance to do a few instructional clinics, including one at Chiyi Elementary, which was associated with the Disc Sports Weekly event that displayed Ultimate, Frisbee freestyle and disc golf. It’s very apparent the sport is growing throughout Asia and I was impressed by Chen and his relentless disc golf promotion. The year was also the beginning of something very big for me — the Avery Jenkins brand. With the help of good friend Kyle Van Cleave, who designed the AJ logo for me, it was a huge step in brand development to create an attractive logo that represented me as a player and the quickness and speed of the discs I throw. Van Cleave Designs also helped me in producing designs for athletic apparel, performance hats, custom discs, stickers and other promotional items to get the logo and brand out there. I look forward to working with Van Cleave Design for many years to come. Many of you may know I love teaching technique and giving instruction to players who want to better their game. I realize it leads to improved enjoyment of the sport. During my extensive travels, I have been hosting clinics ever since I became a professional and it has provided me with a sense of fulfillment as a way to give back. I love witnessing the reaction a player gets when he or she has a straight fairway drive or makes a smooth, dead-center putt. It’s that feeling they get that creates a need for improving and keeps them coming back for more. I was fortunate to be offered the chance to be part of the Discmania “Deep in the Game” series of videos. Jussi Meresmaa, Esa Aroki and I set out to produce high-quality instructional videos that not only provided great information, but also provided some storyline entertainment. Though the main objective of the series is to give the viewer the feel of a pro player, it also offers eye candy in regard to camera angles and movie-like stories. Sure, there are several other YouTube instructional videos, but Discmania aimed for a higher production level and content to set the standard of instructional videos to follow. We produced five videos, concentrating on separate aspects of the game — putting, backhand driving, forehand driving, the mental game, and monster distance. The series was filmed in Southern California. The videos were aimed at the largest segment of players — beginners to amateur players. These videos were all aimed at the largest segment of players being the Beginners to Amateur Players teaching them the basics of the throwing technique and things to think about while practicing. These videos were all offered for Free on YouTube as a way to increase player’s interest in the game while allowing them to become better players as well. It made sense to have these on YouTube so they will be available for years to come. I’ve had an incredible response from the community about how much they learned from these videos. I’ve also heard some high schools and colleges have been using them. It’s very inspiring to know many players out there have learned from the videos you are involved in creating. It’s a powerful feeling. The videos have more than 275,000 views in less than a year. One of these days, they will receive one million views. It’s just a matter of time. Another huge opportunity I had this year was collaborating with Brodie Smith to do a Frisbee/disc golf trick shot video. Smith is a world-class Ultimate player and is well-known for his entertaining trick shot videos on YouTube. 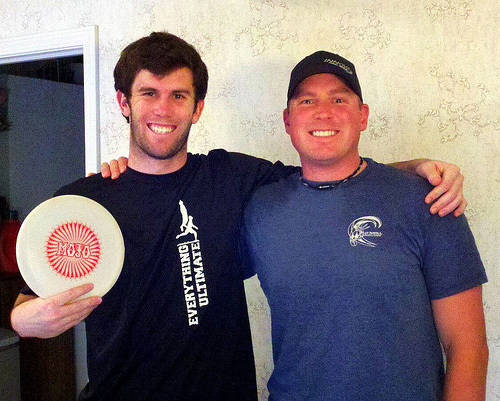 He is one of the most popular individual players in disc sports right now with an incredible following. 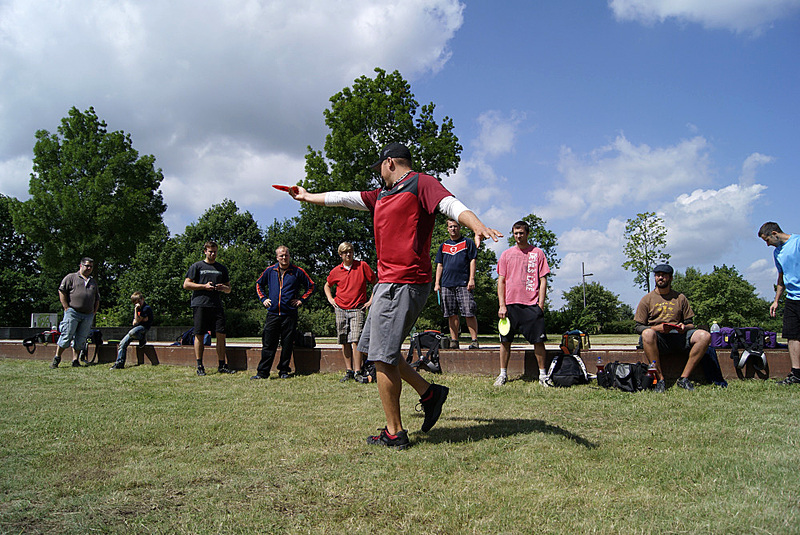 During planning, we decided we wanted to showcase throwing skills with both Frisbees and golf discs. He has a great balance of forehand and backhand shots and has amazing control when trying to hit an object, basketball hoop or basket. He also has a variety of other shots. Throughout the session, we completed a series of 17 trick shots, including 12 combination and five individual trick shots. We set out to do some other videos, including disc golf instruction and a one-on-one disc golf battle. I wanted to increase the exposure of disc golf and thought it was a great idea to include some simple disc golf instructional videos, talking about the basics for Brodie’s “Everything Ultimate” YouTube page. In the end, it was an incredible experience to meet Brodie and do this video with him. It was also great to hang out and talk about Frisbee life in general as I see a lot of similarities between the two sports. Through this, we created an extremely entertaining video with hopes it increases exposure for both sports. 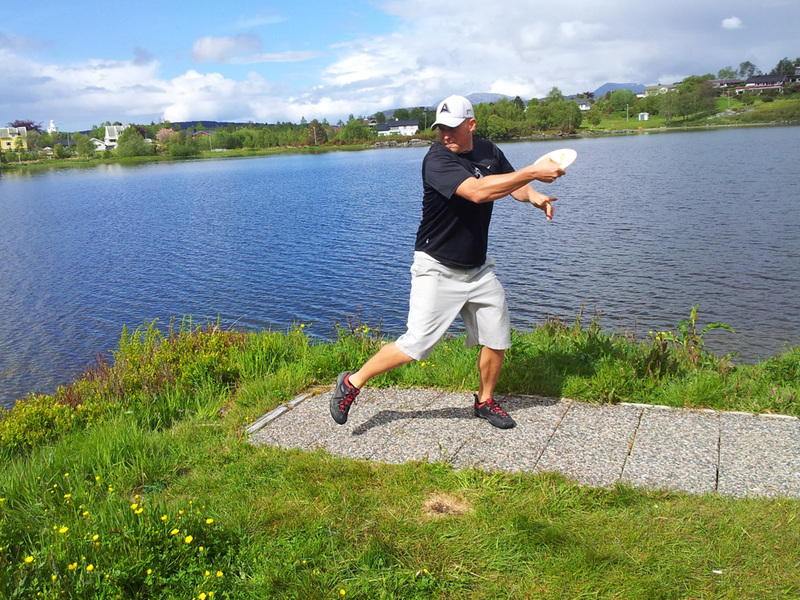 I had the chance to play in my first PDGA-sanctioned tournament in Norway at the Sula Open. I was invited to play in the event by Jostein Haland, but it was during a very busy season in the United States. He mentioned it might be possible as the Sula Open fell between the Kansas City Wide Open and the Beaver State Fling. I couldn’t pass up the chance to play, so I made all the possible arrangements to make it happen. It’s, by far, the most remote destination I have ever played disc golf. The island of Sula is located on the western coast of Norway, about 350 miles from the capital city of Oslo. Sula is among several nearby islands and it is one of the more than 117,000 islands throughout Norway. It’s difficult to get there because it’s either a long drive through the mountains or a flight from Oslo. It’s still a journey once you arrive, going from island to island through tunnels. But it’s the location that makes it one of the cleanest and purest place I’ve ever visited. Another fun fact about Norway is during the summer, there’s daylight for 23 hours per day. That leaves a lot of time for activities throughout the day and you can practice at the course whenever you want. I arrived in Alesund, Norway and was greeted by Haland and Daniel Myrrusten, who I would be staying with for the week. He lived a five-minute walk from Vasset Disc Golf Course, where the Sula Open was being held. It was a great place to stay with a nice house, my own bed and home-cooked meals each night. It was a great tournament, overall. There were youth clinics during the week with children from local elementary schools. They also held a long drive contest, where I placed second to former world distance record holder Christian Sandstrom. I played great throughout the weekend on a challenging course. I was battling with Denmark’s Karl Johan Nybo, a phenomenal player with all the skills. Nobody prepares for a tournament as in-depth as he does. He’s a complete player. It came down to the final round where we traded the lead the entire round. I took a one-stroke lead on the final holes and scored a par on the last hole to win! It was an incredible experience. I can’t wait to go back again this summer. I want to thank everybody there for the experience and to Daniel and his family for the great meals and living accommodations. Following the Sula Open, I was heading back to the United States for the Beaver State Fling as I believe it’s one of the best tournaments and I didn’t want to miss it. But, I also made plans to travel to Berlin, Germany, for a week of instructional clinics throughout the country. So, it was a trip to Europe to play in the Sula Open, then back to the United States, then back to Europe. As a disc golf traveler, it’s what I do, but this was pretty insane. After the Beaver State Fling, I was in Europe again, visiting Berlin for the first time. This is a city I always wanted to visit. A good friend, Greg Marter, greeted me when I arrived. Some may know him as one of the creators of “The Invisible String,” a documentary about the history of the flying disc movement. We made arrangements to travel throughout the country to some disc golf hot spots to do some “Deep in the Game” instructional clinics. Marter had spent months organizing the entire tour. It was great timing, too, as the videos had just been released. We hosted seven two-hour clinics in three days, which allowed me time to play in the Berlin Open. We traveled to Wolfenbuttel, Salzgitter, Gross Ilsede, Vechelde, Helmstedt and Potsdam, where the sport is becoming very popular. We traveled in the Discmania Germany van and were welcomed everywhere we went. Many of the locations had amazing turnouts and the players wanted to learn and improve. I had the chance to meet a lot of new people throughout the tour and witnessed a lot of raw talent. The instructional tour was a great success and I think the players who attended got a lot of information. We are working on plans for a more extensive two-week trip throughout Germany this summer. We’re also planning a two-week tour throughout Finland. I will be spending almost three months in Europe this summer playing in many of the EuroTour events and hosting several instructional clinics. During the 2013 season, I plan to play a little more than last year. I recently completed my 2013 tour schedule and I have nearly 25 tournaments, traveling extensively throughout the United States in the spring and late summer through the fall. My Europe stops will include events and clinics in Norway, Denmark, Sweden, Finland, Germany, France, Austria, Estonia and the Czech Republic. I have always wanted to travel to Europe and play in many EuroTour events and this happened to work out the best of any other year. I’m looking forward to experiencing disc golf in Europe. I’ll only be playing in a few PDGA National Tour events because of these international travels, but I will be playing in all of the PDGA major events throughout the season. I will do my best to continue to be a disc golf ambassador and spokesman for the sport I love during my travels. Avery Jenkins, the 2009 world champion, is entering his 14th year as a touring professional in 2013. You can see more from Jenkins at his website.